Kashi by Kids is a collection of delicious, awesome and organic cereals co-created with kids, for kids. SOLANA BEACH, Calif., Aug. 9, 2018 /PRNewswire/ -- Today, Kashi officially introduces Kashi by Kids, a collection of delicious, awesome and organic cereals co-created with kids, for kids. As the company's first line developed for kids, Kashi collaborated with passionate Gen Z leaders who inspire others to make a difference in the world and share Kashi's desire to make a positive impact through food to create something #AwesomeTogether: Kashi by Kids. "Phil and Gayle Tauber founded Kashi more than 30 years ago after recognizing the need to transform the American diet and show people the good that real food can do," said Jeanne Wilson, Associate Director of Brand Marketing at Kashi. 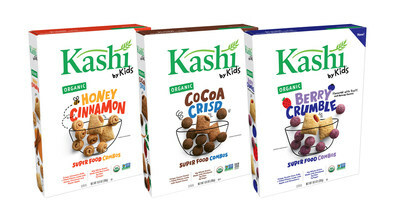 "At Kashi, we strive to maintain that inventor's mindset and set out to do the same in our first kids' products, channeling the creativity and knowledge of kids themselves and combining unexpected ingredients like red lentils and purple corn with nature's delicious flavors such as honey and cinnamon. The end result is an awesome line of organic cereals with superfood ingredients that parents and kids can feel good about." Haile Thomas (17 yrs. old), a youth health activist, international speaker, former network TV cooking show contestant and youngest Certified Integrative Nutrition Health Coach in the U.S. who founded the non-profit HAPPY to help young people embrace and enjoy healthy eating. Hannah Testa (15 yrs. old), a sustainability advocate, international speaker and founder of Hannah4Change, an organization dedicated to fighting issues that impact the planet. Valentine d'Arabian (13 yrs. old), an aspiring professional ballerina and current student at a nationally acclaimed dance school who loves seeking nutritious ways to fuel active lifestyles. Charlotte d'Arabian (12 yrs. old), a passionate baker and former contestant on a major network TV cooking show with a talent for creating unique and delicious flavor combinations. Evan Robinson (12 yrs. old), a talented and creative farm-to-table chef who competed in one of the top cooking competition shows for kids and has been nationally recognized for his philanthropic efforts. Additional information on the Kashi Crew can be found here. "I've loved being a part of Kashi by Kids and the final product is something that I'm really proud of, as it is the result of passionate collaboration, youth engagement, and love for both the health of humans & the planet," said Haile Thomas, Kashi Crew member. "We were fully immersed in and educated about the entire process of creating our Kashi by Kids cereal, and it's amazing to see such a big company like Kashi embrace the views and voices of the next generation." Kashi will continue to collaborate with the Kashi Crew, including new and current members, as it continues to develop and add more products to the line. "Edible Schoolyard NYC is thrilled to partner with Kashi on the launch of Kashi by Kids," said Kate Brashares, Executive Director of Edible Schoolyard NYC. "Kashi by Kids' collaborative, kid-centric product line mirrors our own educational philosophy, which uses hands-on learning and creativity to get kids excited about eating plant-based foods. Edible Schoolyard NYC's vision is that all children are educated and empowered to make healthy food choices for themselves, their communities, and their environment, and Kashi by Kids is a great way to make that vision a reality." The new Kashi by Kids cereals are now available at grocers and natural food retailers nationwide. For more information, visit www.kashibykids.com. Kashi is committed to making a positive impact through food. A natural lifestyle pioneer since 1984, Kashi produces nutritious plant-based foods including cereals, entrees and snacks with curated ingredients. All Kashi products being made today – including its Kashi by Kids foods– are Non-GMO Project Verified, and Kashi is proud to partner with QAI on the industry's first Certified Transitional program, which recognizes crops in transition from conventional to organic. Kashi products are available nationwide in the U.S. and Canada. Kashi is based in sunny Solana Beach, Calif. To learn more, please visit Kashi.com, Facebook at www.facebook.com/Kashi, Twitter at https://twitter.com/Kashifoods, Instagram at https://www.instagram.com/kashi/ or YouTube at www.youtube.com/user/Kashi.